Creativity Inc is one of the best non-fiction books I've read in quite a while. In fact it's almost two books, or rather it is interesting in two distinct ways. First off it is an excellent history of possibly the most important creative company of recent times, Pixar. 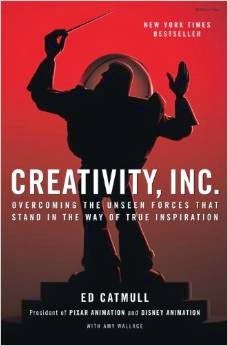 Written by Ed Catmull, one of the company's founders, the book presents an honest and in-depth account of the Pixar story. From early struggles, to the very different energies brought by the likes of Steve Jobs and Jon Lasseter, through the success of Toy Story, to the ups and downs of growing a successful creative company. It's worth reading for that alone. So if you have even a passing interest in Hollywood, or even just Pixar, it is a fascinating peek behind the curtain. For me however the book offers even more if you want to learn something about creative management. Catmull talks a lot about how having a candid working environment was instrumental in their success, and his book certainly follows that mantra. His voice comes across in a very genuine way, and there are lots of intriguing and thoughtful insights into the challenges of running a truly successful creative company. He talks about many of the types of challenges that those working in games will be well versed in. I certainly found myself sagely nodding along as I read. Teams that rely on both highly technical and highly creative sets of expertise face a whole slew of challenges, and Catmull shares his thoughts on many of them. It's well written, insightful, and doesn't pretend to preach a 'golden path'. It might not have set out to be one, but this is possibly the best book I have read about managing a creative process. If that's something that interests you then make sure to check it out!